So, it's probably about time I created a thread to give you guys some idea of what's going on here! This is the adaptation of the novel A Little Princess. For those unfamiliar with the source, it's about a young girl in Victorian England who is sent back from India to live at a boarding school in London (during this time period, a lot of British officers were stationed in India, but it was considered a bad place for British children so they sent them back to England to be schooled). Sara is a sweet, studious, and imaginative girl who likes to make up stories. She misses her father but she adapts to life in England, she has lots of pretty toys, she makes friends... and then bad things happen. And that's probably enough for you to know right now if you haven't read the book. It is also a stat-raiser - but a fairly simple one. This is not LLTQ! You build up and spend stats in order to unlock events, and the requirements for the events are visible, so you're not flying blind (and in a pinch, 'build ALL your stats' is a perfectly good idea). 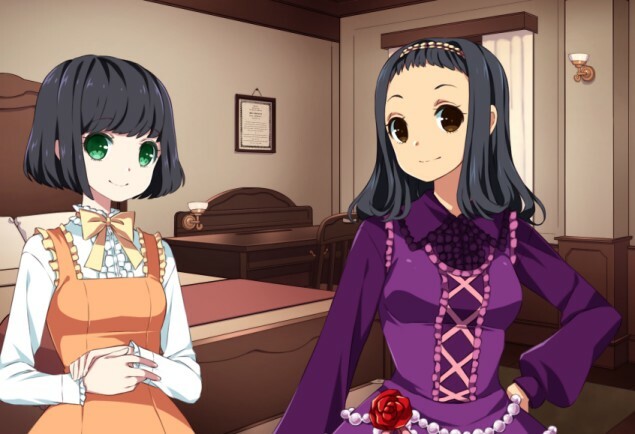 This is a yuri game but it's light yuri, and the routes shade from 'clearly just friends' to 'sweetly romantic' and several points in between. There are six routes planned, I have currently written the first draft for four of them and am just starting the fifth. It's not a very long game and will probably fall in the $10-15 range. From left to right, these are Jessie, Lottie, and Ermengarde. Jessie is a free spirit with artistic interests, and Lavinia's best friend (Lavinia will be showing up later). Lottie is one of the youngest girls at the school, a cute little thing who is known to throw tantrums if she doesn't get her way (or even if she's just bored). Ermengarde has the reputation of being the school dunce, because she's hopeless at most of her formal lessons. This was one of my favorite childhood stories, so I'm super excited!!! I'm so happy you're working on this! I'm so excited about this game! Can't wait. Also, I love the art so far. Just finished drafting Mariette's route, so that's 5/6 in rough. Only one more to go. I have more sprites but I'm waiting to put them in batches together. Sara and Lavinia should be coming soon. Oh, how awesome! I read the book for the first time a year or two ago after never having gotten around to it as a kid, and what a treat. Sara, on the left, is our protagonist, a sweet and dreamy girl often distracted by strange ideas or stories she is making up in her mind. Lavinia, on the right, is Jessie's best friend and the reigning Queen Bee of the school. Why does the mean girl Lavinia look so CUTE? And Sara's so incredibly cute too. I'm drowning in cute! I don't remember half these characters...I really need to reread the book before this comes out, huh? This looks amazing and the book was one of my favorite, most important novels as a child (right up there with Mathilda), so seeing this is very exciting! I'm taking the fact that Lavinia shares the same pic as Sara as cautious encouragement to believe she doesn't get sidelined after Sara has more important things to worry about than the former star student of the school. ...I got invested in Sara and Lavinia's weird, one-sided rivalry when I got older [small]and started shipping them[/small]. The first draft of the script is complete in all scenes. It will be a while before the game can go into public testing, because not nearly enough art is complete for that yet. I will, however, be recruiting private beta readers at some point in the future. I will be looking both for people who have and haven't read the book, since there are different things to consider. I'll throw my name in the ring ASAP for any type of testing. I'm fairly new around these parts (the forum, at least) but I do QA testing for my job if it's any reassurance or character reference. I'm definitely interested in beta reading. I have read the book and I'm very familiar with it.